Hello Candidates, looking for AFCAT 2 2017 Answer Key with Solved Question paper (27th AUGUST 2017). A large number of candidates appeared for the exams. So candidates can check there AFCAT exams questions with the questions and answers below. For any more details comment below. We will get back to you as soon as possible. This article will help you to go through all the questions which was appeared in the exams and also the right answers to it so it will help you to get the rough estimate of the marks which you would be getting. So candidates can check there marks and if you are getting around 150+ marks you can start preparing for AFSB. Feel free to ask questions in below comments. A Large number of candidates appeared for the AFCAT 2 2017 written examinations for grant of Short Service Commission in Flying Branch and Permanent/ Short Service Commission (PSC/ SSC) in Technical and Ground Duty Branches for the following courses for Men and Women which was conducted by IAF on 2017. AFCAT exams are conducted twice a year in which number of students around the country apply for the exams. The answer keys for the examination are released by the number of coaching classes and it is declared by IAF too on its official website for all the papers English, General knowledge and Elementary Mathematics which will help students to check their performance in the exams and get the idea of their scoring for AFCAT. Generally AFCAT exams are of 300 marks in which a large number of candidates around the country appear. 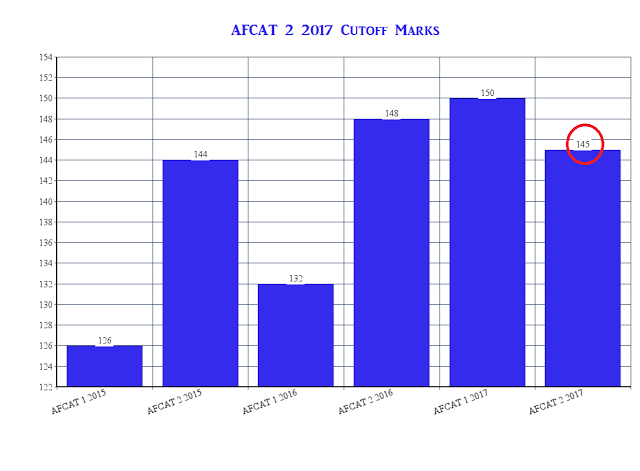 So the expected cutoff marks for AFCAT 2 2017 would be in between 145-150 marks. Candidates who solved questions 60-70 which makes 180-190 marks with accuracy will be clearing exams easily.